San Vicente, Palawan is a lesser-known town tucked about halfway between Puerto Princesa City and El Nido, in the northern part of the island. 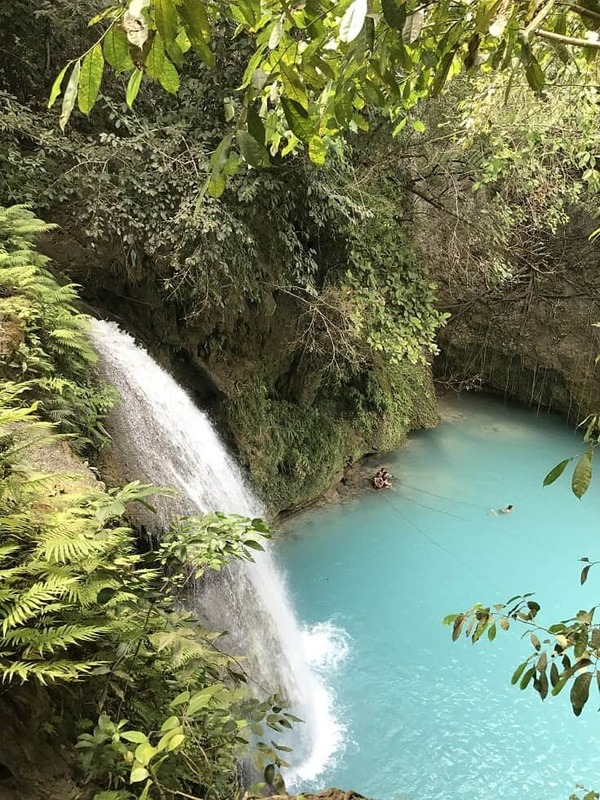 Unlike those more popular tourism hotspots (which undoubtedly helped Palawan earn its place on the list of best islands in the world), San Vicente is largely devoid of luxury trappings. Instead, the town’s homespun and relaxed tropical pleasures offer a very different kind of luxury for those prefer peace and tranquility. 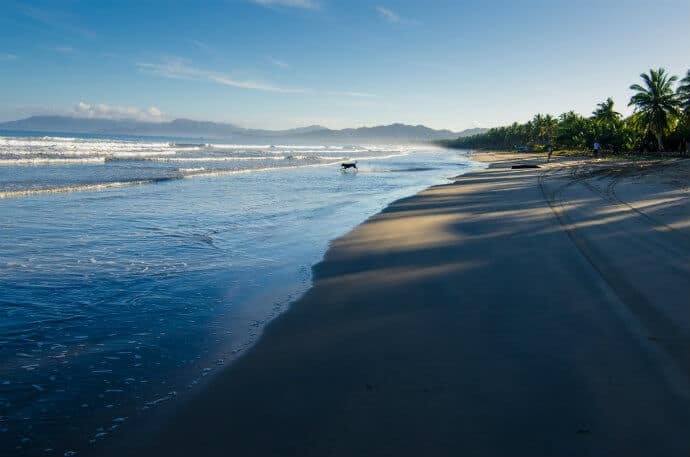 Sleepy San Vicente Palawan boasts some of the best beaches in philippines for nature lovers, fertile coral reefs, beautiful waterfalls, rich marine biodiversity, verdant forests, mangroves, and an array of endemic wildlife species. 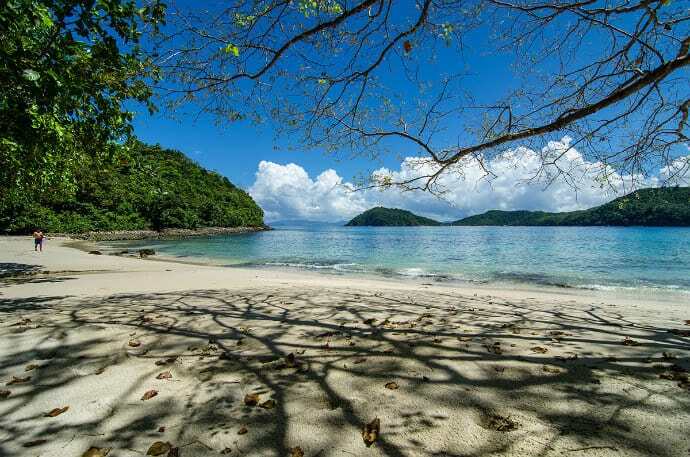 As such, San Vicente is being dubbed the next big thing in Palawan Philippines. Getting to the island from Puerto Princesa takes around 3 to 4 hours of land travel via public van or bus. If you’re coming from El Nido, it takes 2 to 3 hours to reach San Vicente by van. Motorized boats also leave from Sabang, Puerto Princesa and Port Barton, San Vicente. The boat ride takes about 4 hours. From El Nido, boats can also be chartered to bring you to Poblacion, San Vicente. In San Vicente, nature-loving travelers have a chance to enjoy the sun, sea, sand, marine life, and lush rainforest while relishing rustic tranquility. 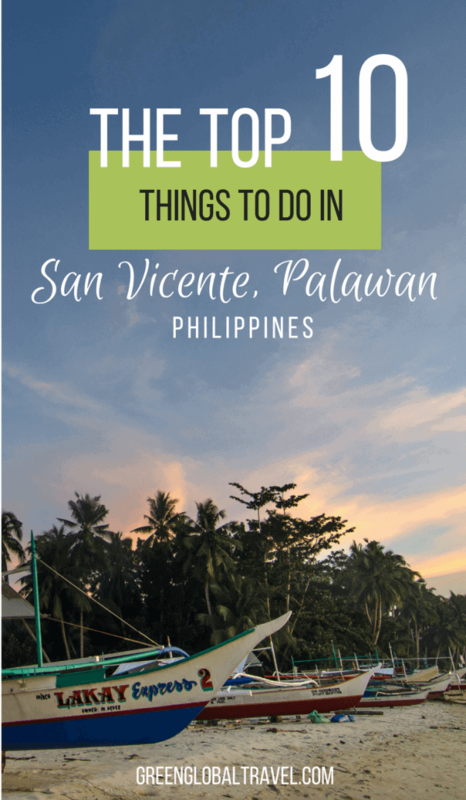 Read on to learn more about the history of San Vicente, the best places to stay, and my recommendations for the Top 10 things to do there. The inhabitants of San Vicente can be traced to several different cultural groups, with the indigenous Tagbanuas believed to be the earliest settlers. Also among the first migrants are the Cuyunens, from Manamoc Island in Cuyo (one of the oldest settlements in Palawan), and the Agutaynens from Agutaya Island. During the arrival of these ethnic groups, San Vicente was still a part of Puerto Princesa and Taytay, which is located north of San Vicente. Close to one-fourth of the town’s 31,000+ current inhabitants are Tagbanuas, and are spread over all barangays of San Vicente. As more settlers arrived, San Vicente was declared a separate municipality in 1969. The town was named after Saint Vincent Ferrer, the town’s patron saint. Following the end of Spanish occupation, a logging concession was opened when Americans came to rule the Philippines. It started in Taytay, through an American soldier named Tomas Wales. A greater demand for lumber led the loggers to move to Itaytay. A decade later, Englishman Col. Burton surveyed the islands and made Itaytay his home base, giving Port Barton its current name. Settlers from the nearby Visayan Islands began to migrate to San Vicente during the early 1980s, at the peak of commercial logging activities. It wasn’t until 1992 that a total logging ban took effect in the area. The rich beauty of San Vicente Palawan’s natural resources has begun to earn the town a place on the tourism map. The annual rate of tourist arrivals rose sharply starting in 2011, and is still steadily increasing today. Hopefully, the creation of the San Vicente Flagship Tourism Enterprise Zone and a Tourism Master Plan will lead towards sustainable tourism development. San Vicente’s Long Beach is considered to be the longest white sand beach in the Philippines. Traversing a picturesque expanse of 9.1 miles (14.7 kilometers), the Long Beach is a peaceful stretch of paradise far removed from the hustle and bustle of mass tourism. Beachfront accommodations along Long Beach are sparse. Most of the accommodations that are currently available are in Poblacion, which is a 10 to 15-minute tricycle ride from the beach. We were lucky to have found a vacant room at the Turublien Long Beach Inn and Beach Bar, where the beach is within easy walking distance. At the beach, you can spend the entire day just lounging by the ocean, taking a long, leisurely walk, cooling off in the crystal clear waters, reading a book, listening to the waves, or just chatting with the friendly locals. Island-hopping will probably prove to be among most travelers’ favorite things to do in San Vicente. Inexpensive tours can be reserved at the booking office at Brgy. Poblacion, near the public market. The package often includes a picnic lunch, snorkeling gear, and all entrance fees. If you’re staying in Port Barton, Palawan (one of the villages in San Vicente), instead of staying near the Long Beach, you can ask for an island-hopping boat rental from the Boatman’s Association Office. Your boatmen will be your best buddies for the island-hopping tour, as they will wear several hats for you. They’ll buy your lunch from the market (after you tell them your preference) before leaving, drive the boat, cook your food, and serve as your guides along the way. 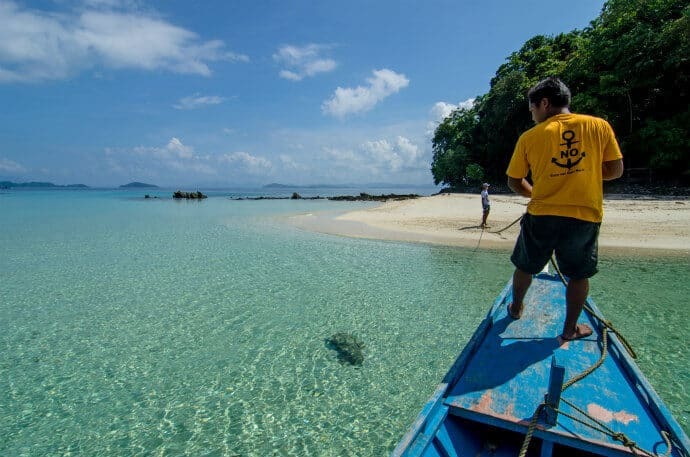 There are a bunch of exotic islands to visit, and plenty of exciting snorkeling sites to dive into along the way. So it’s generally best to start your island-hopping day early and, if possible, spend more than one day exploring the area’s offerings. 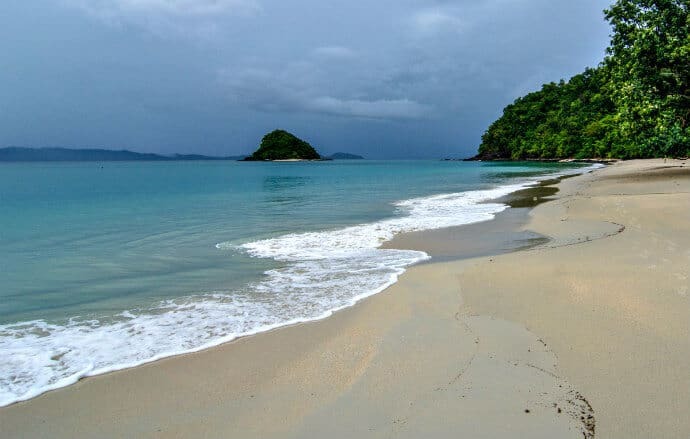 Devoting at least two days to island-hopping, as we did, is a great choice if you just can’t get enough of the beautiful tropical Palawan beaches. Boayan Island, the biggest island in San Vicente. Exotic and Maxima Islands: This one offers two islands in one stop, as you can wade through from one island to the other. Inaladelan Island Resort (formerly German Island), which offers a perfect snorkeling area for spotting sea turtles. Double Island, which can easily be snorkeled from Inaladelan Island Resort (it’s around 200 meters away). Twin Reef, another popular snorkeling site with diverse corals and rich marine life. Sandbar or Starfish Island, a sandbar where hundreds of starfish can be found. Paradise Island, a privately owned island that’s also endowed with an offshore reef. Capsalay Island, which is completely surrounded by fantastic coral reefs. Find out more about different Palawan islands you can see here. The relatively pristine marine environment of San Vicente is one of the best places in Palawan for spotting sea turtles, which are locally known as pawikans. You’ll get a chance to see two endangered species of sea turtles in San Vicente, the Green sea turtle and the Hawksbill. I was elated when our boatman pointed out a sea turtle swimming in shallow water while we were still on the boat making our approach to Boayan Island. I was honestly expecting to see more off the coast of Inaladelan Island Resort, which is a well-known hotspot for pawikan sightings. Unfortunately, the current was strong during that time, which decreased our chances of spotting one. Nevertheless, we were still lucky enough to swim with one sea turtle after our boatmen patiently searched and found the underwater star we were looking for. With the crystal clear water and favorable weather, it was easy to watch from the surface as the precious pawikan foraged amongst the sea grass. 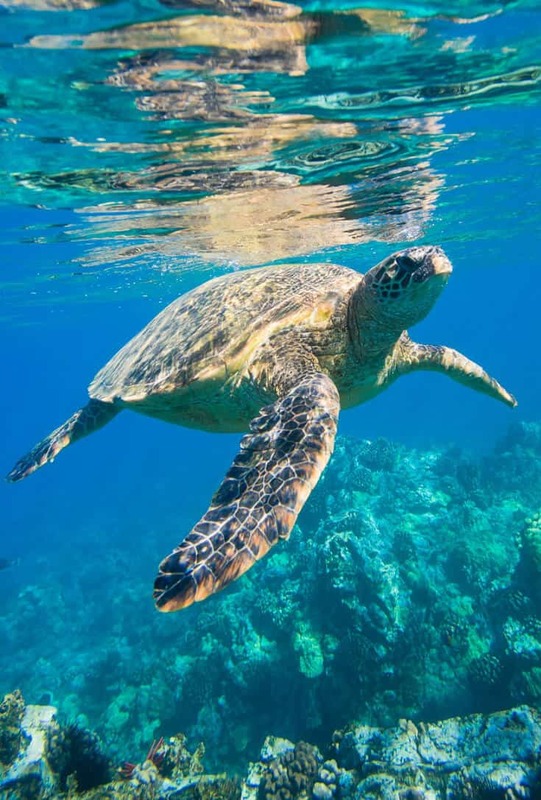 There’s also a turtle sanctuary located in Turtle Bay (near Port Barton), which is under the protection and management of Secret Paradise Resort. The peak sea turtle nesting season lasts from October to March. Unfortunately we did not have a chance to visit the sanctuary during our time in San Vicenete. But that just gives us a great reason to go back! Thelma and Toby’s Island Camping Adventure is a glamping (a.k.a. luxury camping) site owned by a Canadian man (Toby) and his Filipina wife (Thelma). It features rustic tent gazebos, each of which is large enough for two people. The campsite also features a central hut for dining, a camp kitchen, and a small store. You can have a real camping experience here, meaning there’s no wifi and limited hours of available electricity. But you do get the “luxury” of a comfortable bed, furniture, a native shower hut, delicious food, and stunning views of incredible natural beauty. They also have an impressive library of books, allowing guests to select their book of choice before settling down into one of the enticing hammocks overlooking the beach. Among the outdoor activities you can enjoy in this little paradise are kayaking, snorkeling, swimming, and paddle boarding. This was our last stop on our first day of island-hopping, before getting back to the Long Beach. Sadly, ominously dark clouds started to hover over the beach and rain started pouring down just as we docked in this nature-lover’s haven. We found that a glass of cold beer was the best fix to counter the gloomy atmosphere. A Palawan beach adventure just wouldn’t be complete without several servings of fresh seafood. You will not find any fancy restaurants in San Vicente. But that definitely doesn’t mean you cannot find good food here. Fishing is a major economic activity in this town. In fact, the locals told us that most of the fish caught in San Vicente are ultimately transported to nearby Roxas and to Puerto Princesa, due to the higher demands in these areas. 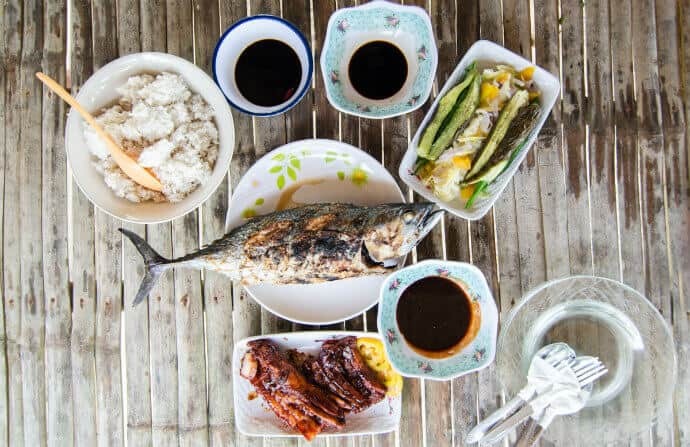 If you get a chance while you’re in Palawan, treat yourself to a “boodle fight.” This popular meal consists of a bounty of food spread out on a table covered in banana leaves. A typical boodle fight includes rice, clams, crab, fish, mussels, shrimp, squid, meats, and a variety of vegetables. The Filipino military custom has diners standing shoulder to shoulder on either side of the table, chowing down once the the command is given. It’s designed to be messy, mushing the rice and ulam (the Filipino word for the main dish) into a ball. But it’s also delicious, especially when you eat it while gazing out over gorgeous ocean views! Port Barton is an idyllic fishing village in San Vicente that, thanks to its remote location, has yet to fall victim to tourism development. Many travelers choose to stay in the area and use it as their base for island-hopping. Although Port Barton is technically part of San Vicente, it is often referred to as if it is a separate town all its own. This might be due to the area’s relative seclusion from the other, more accessible parts of San Vicente. From Puerto Princesa, Port Barton can be reached using the same road you take to get to San Vicente town proper. Before reaching Roxas, you have to turn left on a 14-mile (22-kilometer) road, some of which is dirt. From El Nido, the best way to reach Port Barton is via a 5 hour-boat ride. Our itinerary involved going from Puerto Princesa to the Long Beach in Poblacion, San Vicente. On the second day of our island-hopping from Poblacion, we asked to be dropped off at Port Barton. Apart from island-hopping, Port Barton can be enjoyed simply by strolling along its coast. You can watch the sky change colors at sunset, with birds flitting across the sky in the backdrop and the fishing boats in the foreground. 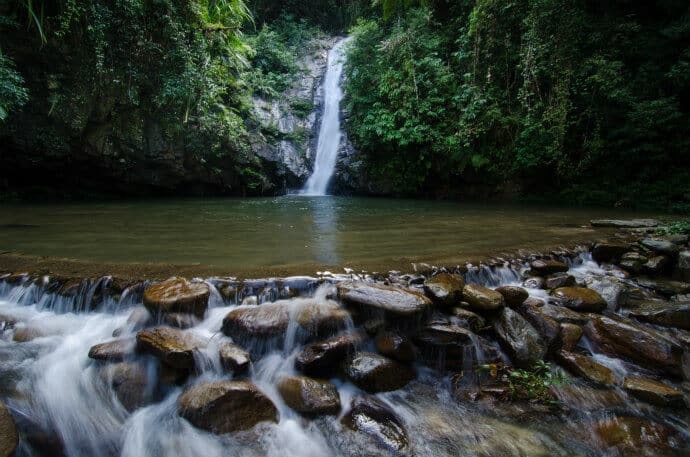 Once you make it to Port Barton, you can head through the rainforest and visit the beautiful Pamuayan Falls. To reach the waterfalls, you’ll need to hike 2.5 miles (4 kilometers) north from the town, which takes about one and a half hours. The hike is fairly easy and picturesque, but it does require you to cross a shallow stream as you approach the falls. Wearing comfortable water shoes with good traction is recommended. You can ask the locals or the staff at your accommodation and they will gladly tell you how to get to the falls. Bigaho Falls was originally part of the itinerary for the second day of our island-hopping itinerary. Sadly, we were on a tour with other groups, and the majority wanted to spend more time snorkeling. 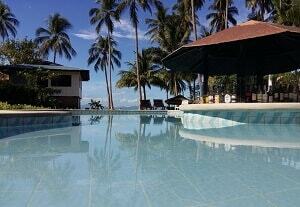 This just gives me one more reason to return to San Vicente! Towering at 50 feet (15 meters) high, the falls can be reached by a 20-minute boat ride northeast of Port Barton. It takes another 20-minute trek from there to get to the falls. Mangroves and other maritime forests serve as fertile breeding and nursing grounds for fishes, crustaceans, and mollusks. 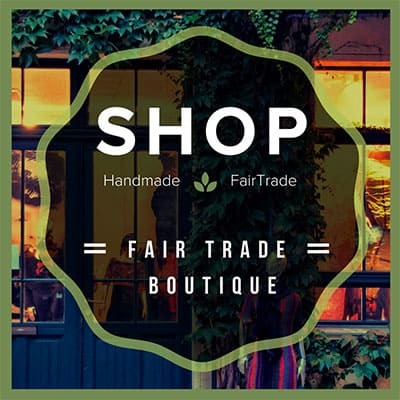 In this way, they enrich the supply of aquatic resources. Mangroves are magical, with the power to be mesmerizing, eerie and peaceful all at the same time. They act like natural filters that trap sediments, preventing those sediments from choking corals and seagrass. For a better appreciation of the important ecological roles that mangroves play in the maritime ecosystem, explore them via a river cruise along Inandeng River. Tours depart from the village of New Agutaya, near the Long Beach. I didn’t have the chance to do this cruise, but Turublien Long Beach Inn and Bar (where we stayed) is actually located near the banks of the Inandeng River. The staff mentioned that traversing eastward of the river from their location is a dense mangrove forest. 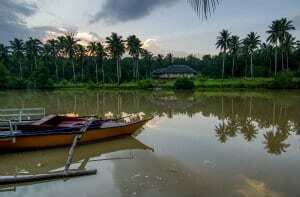 To do the mangrove river cruise on your own, you’ll need to rent a small boat or kayak from the New Agutaya village. You can also inquire at the San Vicente Municipal Tourism Office, where they can help you with arranging a guided river tour. 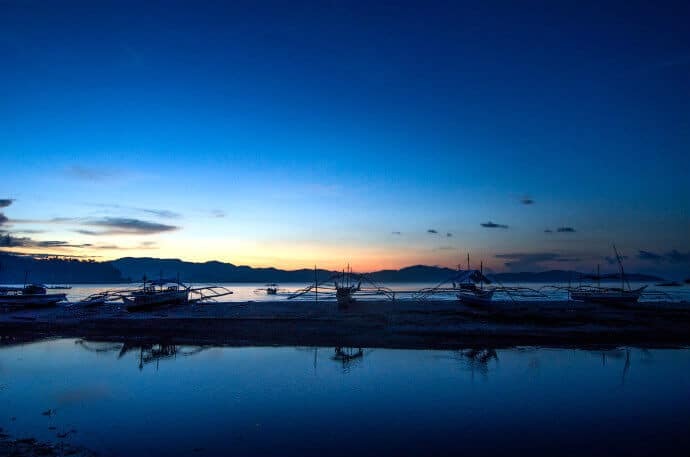 San Vicente is increasingly gaining recognition as a tourist destination in Palawan, especially with the recent opening of the new airport near the town center. As of now, the airport can only accommodate small, private planes. But commercial airline operations are definitely part of the area’s long-term growth plan. According to the locals we met in the Long Beach area, many people have sold their San Vicente lots to investors, who are already eyeing the development of tourist facilities near the beach. While locals are excited about tourism becoming a gateway for boosting the San Vicente economy, my enthusiasm is mixed with hesitation. Unchecked tourism development often takes a toll on the local environment when once-pristine ecosystems are converted into commercialized areas in order to cater to tourists. Sustainable tourism development requires the concerted effort of the government, the tourism industry, tourists, local communities, and other relevant stakeholders. 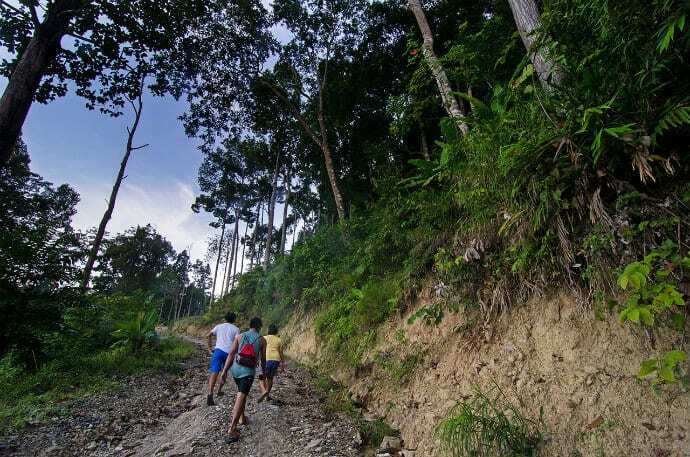 The local government in San Vicente does actively work to create policies aimed at controlling development and protecting the area’s ecosystem. 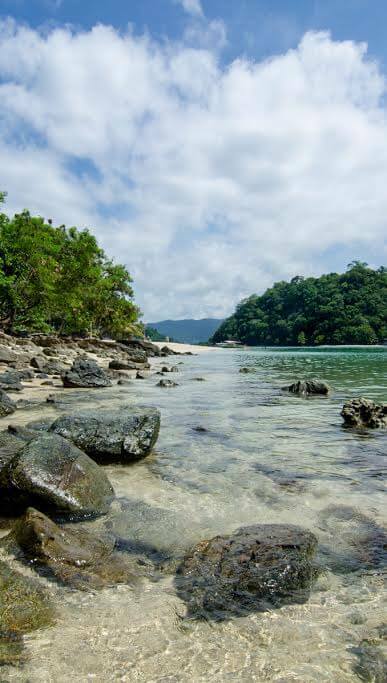 At present, about 43% of San Vicente’s total land area is protected under the National Integrated Protected Areas System (NIPAS), while 12 of the 22 local islands are protected as part of the Port Barton Marine Reserve Park. As a result, I’m hopeful that local development plans will be implemented successfully to ensure environmental conservation while also boosting tourism. Meanwhile, the best we can do as individuals is to minimize our negative environmental and social impacts by being responsible travelers. 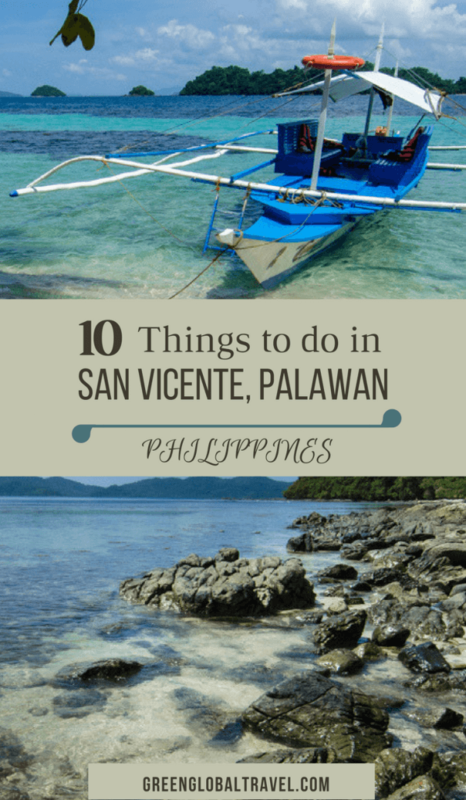 So why not add this to your list of the best things to do in San Vicente, Palawan? Check out these great sustainable travel tips to learn more about how to reduce your negative impacts to the environment. Turublien Long Beach Inn & Resto Bar– If you are looking for a budget accommodation with basic facilities close to the idyllic Long Beach, Turublien Long Beach Inn and Resto Bar is a great place to be. You have to cross a river via a small boat (which takes about a minute) to access the rooms. 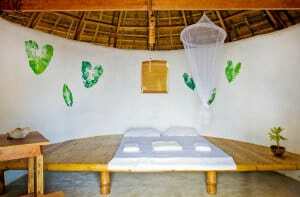 They have small nipa cottages by the beach where you could eat fresh seafood or simply lounge. Turublien means “heritage,” and the owner is committed to preserving the authenticity of the surrounding fishing community. Read Reviews & Check Rates. Sunset Beach Resort – One of the top-rated San Vicente Palawan resorts, Sunset Beach Resort is located Macatumbalen beach. Each room has views of either the garden, pool or the ocean. This is the perfect place to relax, unwind and enjoy the most amazing sunsets. The resort offers delicious fresh food or you can walk 15 min into town. The resorts convenient location makes it easy to reach the beautiful islands around San Vicente by either private or shared boat. Read Reviews & Check Rates. Tribal Xperience Port Barton– Tribal Xperience Port Barton is 3 eco-resorts in one, including the Tribal Xperience in Port Barton town, and the Waterfall Camp and Adventure Camp in Bunuanguin Beach. 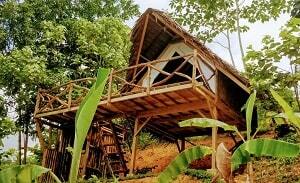 All accommodations feature the use of native materials like bamboo, reeds, and cogon, giving it a rustic feel. We stayed at the Port Barton accommodation. Our fan-cooled room was comfortable and had all the basic amenities we needed. The food there is great, and the homemade breads they serve for breakfast are freshly baked. Electricity in Port Barton runs only from 5 PM to midnight, but a generator provides 24-hour electricity at the common area. Photo provided by Tribal Xperience Port Barton. Read Reviews & Check Rates. Barton Jungle Lodge– If you’re looking for a jungle hideout where nature sounds will lull you into a restful sleep, then this is your place. There’s no wifi, but the resort does have a lovely cafe & bar. The bungalow design encourages visitors to spend their time outside on their private balcony (some with ocean views). For beach lovers, White Beach and Coconut Beach are a 15-20 min walk and there’s hourly transportation to Port Barton for those looking for more nightlife. Read Reviews & Check Rates. Jing Calonge is an environmental consultant from the Philippines. She primarily works on pollution prevention assessment, environmental management systems, and industrial waste management. She also happens to love travel and photography. She considers traveling as the best way to discover not just the world, but to learn about yourself. 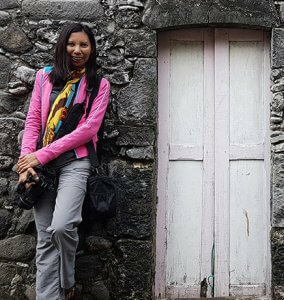 Savoring one travel experience at a time, she writes about her travel experiences at Finding Jing. Jing hopes to steer travelers’ awareness on the need for environmental protection and responsible tourism. She recognizes that traveling green isn’t easy, but believe that by developing the right mindset, it can be done.